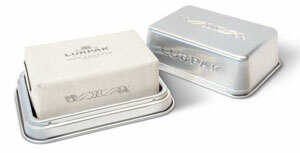 Arla’s new Lurpak brand Slow Churned Butter — made with a method inspired by early dairy tradition in small batches — was launched in November 2013 in a beautifully designed, brushed aluminum dish that holds a 200-g stick of butter. “The new Slow Churned Butter is being used to build Lurpak’s credentials as a foodie brand,” says Shaun Jones, Realisation Director for Pearlfisher, the design agency responsible for the brand strategy, structural innovation, and packaging design for the new product. Pearlfisher’s challenge for the new brand, Jones adds, was to create a balance between the Lurpak brand equities and heritage, and the artisan positioning of the new product. Among Arla’s key requirements for the package were that it had to disrupt the category and stand out from the rows of plastic and paper on-shelf as well as be commercially viable, food-safe, and financially feasible. It also needed to fit in with the company’s corporate vision for their product packaging to become fully recyclable by 2020. During the package design process, Pearlfisher conducted a cross-category audit to understand how other brands were doing premium. “The introduction of the cream background softens the established silver and blue Lurpak colour palette, which has been retained to ensure a visual connection between Slow Churned and the rest of the Lurpak range,” says Jones. Inside the dish, the butter is wrapped in a cream-coloured foil and paper laminate material that provides product protection and freshness while creating a natural, aesthetic appearance. 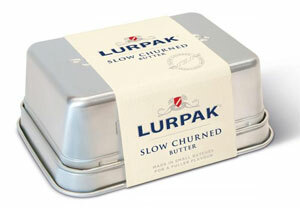 Lurpak Slow Churned is being sold in UK Tesco, Sainsbury’s, and Waitrose supermarkets for ₤2.30 per pack.